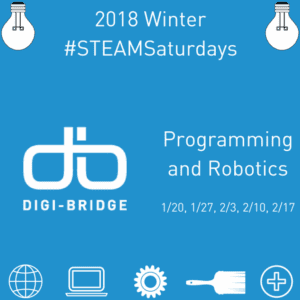 In order to bridge the digital divide, Digi-Bridge works to uncover and help create equitable pathways to careers in STEAM fields. Often, scholars begin on this pathway in middle school, where they’ve been assigned a counselor who helps them choose classes that fit their interests and aptitudes. This process continues into high school and college where a scholar chooses their major. 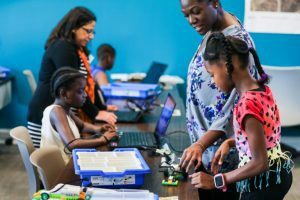 However, times are changing and as the need to fill STEAM careers is growing, we’ve found that the pathway to these jobs may not seem quite so straightforward to many scholars. It seems that the sooner we can help scholars realize their interests and aptitudes the more likely they are to keep moving towards them. 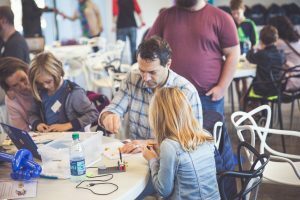 As we work to create the opportunities for scholars to explore and experiment, we meet the most brilliant and capable STEAM professionals who share in our vision. 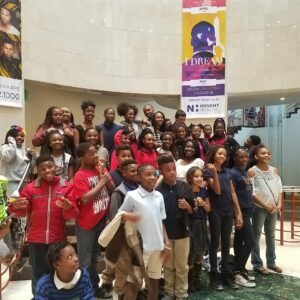 These meet-ups turn into partnerships which turn into opportunities to expose our scholars to the pathway to STEAM careers. 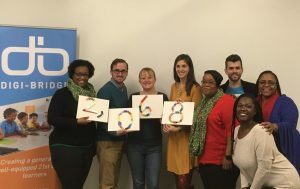 One such partnership we’ve enjoyed has been with Lenora Crabtree, UNCC Biology Services/PhD student and Tiffany Bell, rising Junior Biology student at UNCC. These STEAM professionals brought an exciting chemical reactions lab to our #STEAMSaturdays scholars at Allenbrook Elementary School. Using Tiffany’s previous lab experiments and research, these scientists provided an exploration of the relationship between the oyster shells and changes of temperature and acidity in the surrounding water. 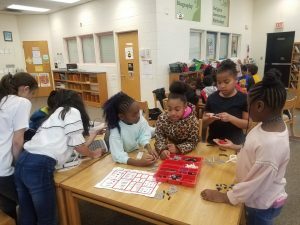 Lenora and Tiffany captivated our scholars both by effectively presenting the science at the level of the 4th and 5th graders, and by relating this change in the oyster’s world to a change in their own world, their neighborhoods and even their homes. I can’t think of a better way to outline the path to being a scientist than by bringing scientists from our local university directly to our scholars. Would you like to help us continue to provide opportunities like this for our Digi-Bridge scholars? 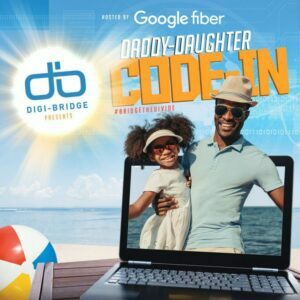 Learn more about how you can help us #bridgethedivide by following us on social media (@DigiBridgeUS), and join us on June 17th at the Google Fiber Space for our Summer Daddy Daughter Code-In. This is another great opportunity to expose our young ladies to STEAM concepts and careers!  Click here to learn more about and register for Digi-Bridge courses and events. Here’s to revealing the pathway for Charlotte scholars!